I guess I have two machines I often call my favorite; one is a favorite for writing and one is the one I most enjoy owning. 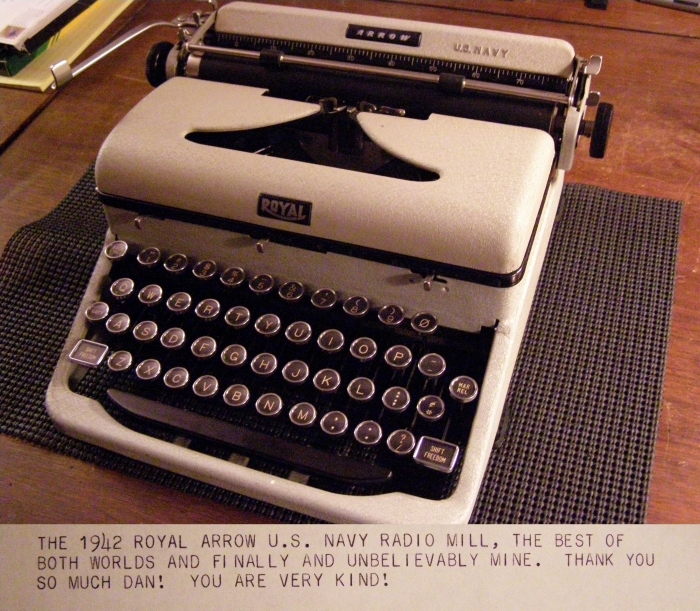 I love the Royal Aristocrat/Arrow/Quiet De Luxe for writing and I own several. One particular Aristocrat is my favorite and another Aristocrat is my most used (the one pictured above). It is hard to top these Royals for typing experience, at least in regard to my own personal tastes. The Underwood I love for several reasons. I am pretty interested in World War 2 and I have been for most of my life. A typewriter that served my country was really high on my want list for a long time before I found this. There are machines labeled as Navy and others labeled as Army but I was particular to the Navy once since my father was an officer in the Navy and so are a handful of my extended family and friends.I grew up around. The Underwood has a few features modified for military use including an easy to read 9-pitch typeface and a shift lock to keep the carriage from bobbing in an airplane. So, what if these two favorite machines could be combined into just one? Well, here is a 1942 Royal Arrow built for and used by the U.S. Navy during the second World War. I am so psyched to have this. It was actually a gift from a fellow typospherian who knew I wanted it badly and decided he would like to give it to me. Wow! This has been THE top machine on my want list for a few years now, and well, here it is! Will it be the sole favorite machine? Probably not, because the large all caps typeface is not always appropriate or preferable, but it is way more a favorite than the Underwood already was. And it types just like those other Royals... and sometimes you do need large all caps... ok, it's probably the best candidate for Mark's favorite typewriter. It's so awesome. Congratulations on the fine typewriter! Perfect price too. It's good to have a friend who knows what you appreciate. I've been searching for one of these for decades and have never been able to find one in good shape that I could afford. Congratulations Mark! Such a fine machine. A WWII Arrow - kind of gives new meaning to the "Shift Freedom" key! I love all of this story. The White Whale. The Kindness. The generosity of spirit. And at the end of it all, a pretty typer. Fantastic. That Aristocrat looks just like my 1946 Quiet DeLuxe, which is my favorite as well. Incredible action on these machines.